Another week begins with the Nintendo Download Update details in Europe, and this time around we have a Nintendo 64 classic joined by a long-awaited retro-styled new release on the home console. Beyond that we have an exciting demo, 3DS Home Themes galore and a few discounts; let's get to it. Adventures of Pip (Tic Toc Games, €13.06 / £11.79) - This stylish platformer has been on some wishlists for quite some time, taking us back to a retro age with pixel-based visuals and utilising a clever mechanic of powering up between generations of visual styles. Though it can occasionally fall flat in some secondary areas, it's nevertheless an accomplished, enjoyable experience - we gave it a solid recommendation in our Adventures of Pip review. 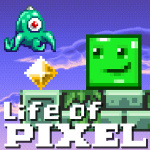 Life of Pixel (Super Icon Ltd, €9.99) - This is an intriguing platformer - now coming out in Germany having already arrived elsewhere - with the premise of each stage representing particular consoles and generations, while revisiting classic games with a backdrop of chiptune music. It delivers in many respects but is flawed with some of its level design, for example - check out our Life of Pixel review for a full lowdown in which we give in a recommendation. 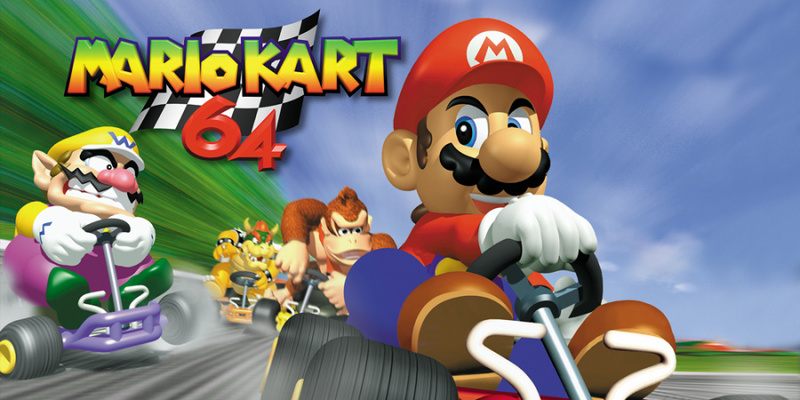 Mario Kart 64 (Nintendo, €9.99 / £8.99) - Though Super Mario Kart is rightly acclaimed, this joined a number of other N64-era releases with a special new weapon: four player matches. Like many N64 titles it boasted of early polygon-based visuals, and to this day is much loved for some of its iconic courses and it's different feel to more modern entries. We loved this in our Wii Virtual Console review many years ago, and will now give it another look. Radiohammer (Aksys Games, €5.48 / £3.98) - After a glut of rhythm games earlier in the 3DS' lifespan they've been less common of late, which certainly makes this one eye-catching. It's all about taking down villains and making the world "a safer, funkier place", and thankfully the soundtrack and gameplay make it all worthwhile. We gave this a strong recommendation in our Radiohammer review. Moco Moco Friends (Aksys Games, €36.59 / £26.98) - Fans of RPGs in which you develop teams of critters to explore and then fight other teams of critters are quite well served on the 3DS, but Aksys Games is pitching its own release into this crowded market; it's aiming for plenty of cuteness with this one. Goosebumps: The Game (GameMill Entertainment, €24.99 / £19.99) - A 'point and click' adventure game that may have a whiff of object finding about it, this serves as a prequel to the film that's rolling out in Europe over the next month. I presume this will transfer with the normal fee from my Wii Channel? Radio Hammer and the Project X Zone demo for me. Come on Nintendo just release Smash Bros 64 already, after Genesis 3 would of been perfect. "This is an intriguing platformer - seemingly delayed from an expected 2015 release in mainland Europe"
Uh no, I live in Holland and I have the game a few weeks now. Even at a discount! Can't wait to have Adventures of Pip. Will get MK64, but will need to see about upgrading from Wii mode (no idea how to.do it) as I caved in a few months ago for it. Looks like a nice line-up, but I would've loved to see Mario Kart 64 on the 3DS VC. I'll be upgrading MK64, this means the only Mario Kart games not playable on Wii U (excluding Wii mode) are Double Dash, Wii and 7. The first and third of those 3 will never happen but Wii could get a digital release. @Jazzer94 I think it'll come same day as Bayonetta and Corrin DLC as a complete farewell to Smash. @GLA You don't have to do anything, it's an automatic discount if you've purchased on Wii VC. I'll take the Project X Zone 2 demo. That's all. That confusion aside, Radiohammer for me, plz. I was going to buy it on the wii shop when I get paid on Thursday. . Oh nintendo you must have read my mind. .. I'm interested in Radiohammer and Adventures of Pip but I won't be getting them for now. I'll get Radiohammer when I'm in a need of another rhythm game and I'll probably wait for sale on Adventures of Pip. Probably I'll get MK64. After the releases on the Wii U Virtual Console of Xenoblade Chronicles and Pandora's Tower I wonder if Nintendo will release some day The Last Story, too. It would be logical, just to close the circle. I'll upgrade Mario Kart 64 from Wii, and also take Project X Zone 2 demo. @shinynewbicycles "This is an intriguing platformer - now coming out in Germany having already arrived elsewhere..."
Is this the us version??? MARIO KART 64 IS THE BEST GAME MARIO KART GAME OF ALL TIME! No doubt which game which I will download. Pretty good week for us in Europe, but I think I'll stick with my original MK64 cartridge. no major discounts. i sense a sale event coming for europe to reflect winter warm-up for north america. Mario Kart 64 was awesome, but I'd be afraid playing it now would shatter my rose-tinted spectacles. @scamander Ah-ha! I'll read more thoroughly next time. Thanks for pointing that out. Hopefully this Mario Hanafuda theme will be based on a different deck to the one in the "exclusive" Club Nintendo Mario Hanafuda theme. The latter is my favourite 3DS theme (to the extent that I may never bother buying another) but it would be a bit irritating if we spent our last stars on something that became readily available for £1.79 so soon afterwards. By the way, I wonder if the WiiU's Mario Kart 64 download will reinstate the Mirror Mode that was missing from the Wii download? RadioHammer is like the best name EVER! I'll buy it at a later date. Now where is Sonic Advance or Super Princess Peach? Yeah!! It includes great circuits: Donkey Kong's Jungle still is the best DK circuit, is you ask me. I also love Choco Mountain, Peach's Royal Raceway, Yoshi's Valley, Wario Stadium, Moo Moo Farm and Banshee Boardwalk. My favourite Mario Kart is Double Dash!! because it is the most balanced and challenging and has the best battle mode. However, Mario Kart 64 was and still is an awesome Mario Kart game. Which version is Europe getting? 50Hz or 60Hz? I hope it's 60Hz!! Nothing for me this week. Again! Nintendo must hate money. @ChristopherM Mirror Mode wasn't missing from the Wii download, you had to unlock it and it wasn't called Mirror Mode in MK64 but rather "Extra". As for the theme, I also straight away thought of the Club Nintendo exclusive one however unlike you I want it to be made available. Not because I particularly care about it (I only got the Nintendo Consoles one) but instead because with Club Nintendo (and its successor) the only exclusives should be physical goods. Yes! I love Mario Kart 64. I remember at the time it was regarded as disappointing (I think because of the 2D sprite racers) but compared to some of the more recent entries it's really great. I particularly I love the end credits music! @Sligeach what game(s) are you waiting for on The Virtual Console? @Nico07 Star fox 64, Majoras mask & GAMECUBE!!!!!! And nothing for North America this week I bet. Man all this eshop money to think I would get Mario RPG and more but no nothing yet besides Zero Mission. Finally we in Europe get Adventures of Pip, I've been waiting for it for over six months since the North American release! Also cool that Project X Zero 2 demo comes out now as well. Mario Kart 64 upgrade for me. Adventures of Pip and Radiohammer are on my radar too. Might even try The Quiet Collection. @Grumblevolcano @ChristopherM I think that Mario Hanafuda is the new deck that has been available in Japan since a few months, I have the cards and they are pretty nice, since every card is now Mario-themed (the ones which were already Mario-themed in the Club Nintendo deck are different, by the way). Nothing for me this week. Adventures of Pip, Life of Pixel and possibly Radiohammer and Mario Kart 64 might amuse me for a while, but there's too many other games I'd prefer to play instead. Definitely Adventures of Pip and the Project X Zone demo. I'll probably get MK64, too. I'll be upgrading MK64, but I'm a bit concerned that there's no "This is the US version of the game" in the press release. I'll be downloading the Project X Zone 2 demo. Nothing else for me. I'm curious to see if you can save your ghost race data this time. You couldn't on the original Wii VC release. @Grumblevolcano @brooks83 You two are right. The only missing thing in the Wii version is the ghost save feature. I wonder if that will be available this time, and what version will we get? Hopefully, the NTSC version. PxZ2, the wait is almost over! I saw that "Themes galore!" statement and immediately had high hopes for the classic SEGA themes... welp, not this week, I guess. MK64! I do have N64 but never got MK for it.... Ah, I remember playing it at my friend's house. I'm like 90% positive I will get the EO theme. looking forward to playing Mario Kart 64 on my NA Wii U in a few months. Mister_Wu - Thanks. I'm aware of the two different physical Mario Hanafuda decks (the newer deck looks pretty, but I consider the older one more playable, with just 16 redesigned cards). However, how do you know the new theme is based on the newer deck? Hopefully you're correct though. Hopefully Mario Kart 64 comes to North America as well this week. Mario Kart 64 n Project X Zone for me this week. What are the chances Gamespot finally gives it higher than 6.4? So we have WindWaker HD and soon Twilight Princess HD from GameCube sources, but it seems that it would be a waste if we didn't get HD remasters of a few other games as well. But then again if the NX is releasing this year or early next, I wouldn't be against having a few HD remastered GameCube games be reserved for the NX. Thankyou nintendo finally we get MK64! Great timing too just a month before I go back to uni and can battle my friends now by being able to use Wii U controllers. Now I'm getting excited that the Mario Parties will be released soon now all the other Mario games are out! Fingers crossed Mario Party 3 comes out first then I won't need to dig out my N64 any more. Adventures of Pip is a long time overdue really. Don't know why the developer(s) had such a long delay getting it on the EU eShop, but I think £11 is a fair price. Though that puts it on the same price range as Fast Racing Neo and I'm not sure which of them is worth it more. I think I'll get AoP. @shinynewbicycles it's the same one. It's finally releasing in Germany I think. I hope the fix Moo Moo Farm in 2 player GP mode, the Wii VC version run at double speed. @Nico07 yep, SF 64, free with SF Zero would be great! Also sunshine and FZero GX HD needs to happen for wii u! FZero could have the base GX game with online multiplayer and then add new story chapters and courses as dlc!!! @mikegamer I bet it will be another crappy GBA game seems like that is all nintendo of america actually knows how to release. Can't wait to play MK64 sometime next year on my NA Wii U. @JH64 I would agree that F-Zero is a title that would do great as a GameCube HD remaster with a few features added. It's a franchise that hasn't had much happen with it since the GameCube (aside from the Mario Kart 8 DLC) and I would think would do well. Nintendo could even bundle a Blue Falcon amiibo and have it provide access to the AX courses or something like that. Mario Kart 64? How disappointing. More fuel to give to the overrated game in the series. Will probably be downloading the Mario Hanafuda theme. The only Mario Kart game I currently can't play is this one, but living in North America I suppose it probably would be safe to say see you in September Mario Kart 64, because NoA is so slow at releases. @chiefeagle02 Hopefully. But we're still waiting on a number of other VC games to make that same jump that should have by now ... I'm looking at you Super Mario RPG and Waverace 64! No 3ds discounts? That's surprising. I wouldn't mind seeing other games on sale. Well Radiohammer for me I think! Well I can upgrade my first game from Wii to Wii U now!!! I was complaining at the cost to upgrade long ago but tbh I've never had to do it until now and it bothers me less I guess!?! @123akis about £1:79 I think? @GLA Even after you upgrade to the Wii U VC version of a Wii VC game you already have, you can still keep and play your Wii VC version. It's useful for if you find that some games are preferable with a Gamecube controller or have a little input lag with wireless controllers. @BarryDunne Yes, I'm wondering the same about the european release of Shadow Puppeteer. Perhaps it got pushed to next week? EDIT: Apparently, it has been moved to next week. Meanwhile in America, we can enjoy a rousing, copyright-infringing game of Bigley's Revenge, because that's the only thing we get on the eShop! And it was even removed, at that! Yay, 'Murica! We'd better get MK64 soon... We still don't even have SMRPG, do we!? What happened to Eshop North America. No Mario RPG, Mario 64 DS, or Mario kart 64. Wtf. @JH64 GameCube, Dreamcast, Neo geo,turbographx 16 and Genesis!! Nothing again, because Nintendo hates those who love the 3DS VC. Can't pass up on either the new rhythm game or the new hanafuda theme. Every week Europe gets much better VC than the US. I'm so sick of it!! All the time NoA gets amazing discounts on the eShop, while NoE did not even get proper Xmas deals. Not even talking about the amazing humble bundle from a while back, worth more than 100$ while NoE pays full price. @gsplatinumdp: I said the same thing to myself earlier today! Might be lucky to get that, SMA4, SM64DS, and SMRPG by my birthday too!